sailboat. 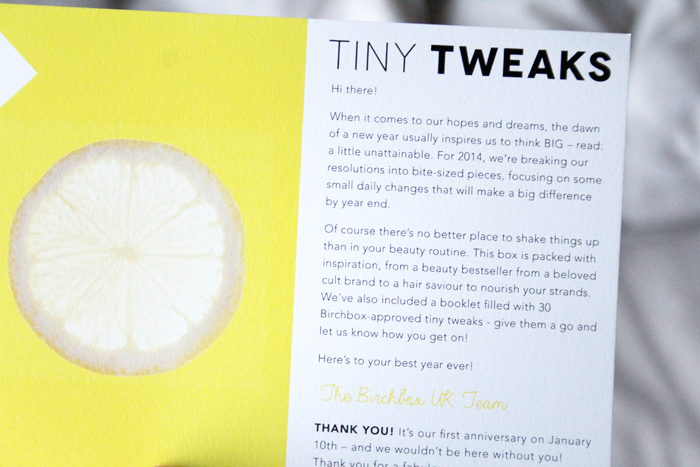 : BirchBox January 2014! Yesterday I popped up a quick post showing what was in my January Love Me Beauty box and today, after the awesome people over at BirchBox got in touch, I've got their January box here and ready to be opened. 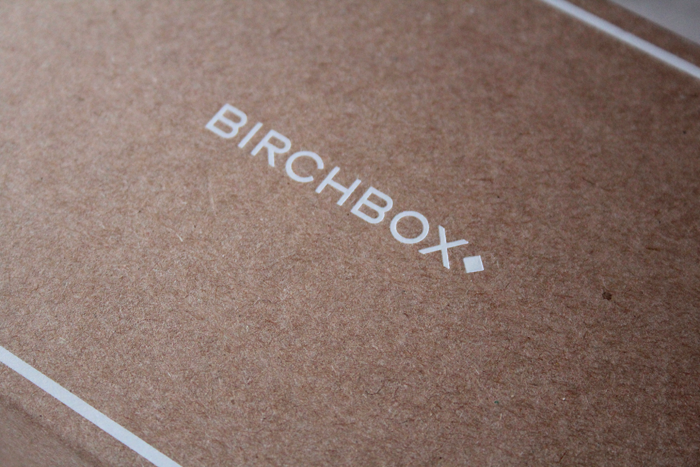 There's something very cool about BirchBox, I'm not sure what it is, they just have that kind of effortless, fun vibe! 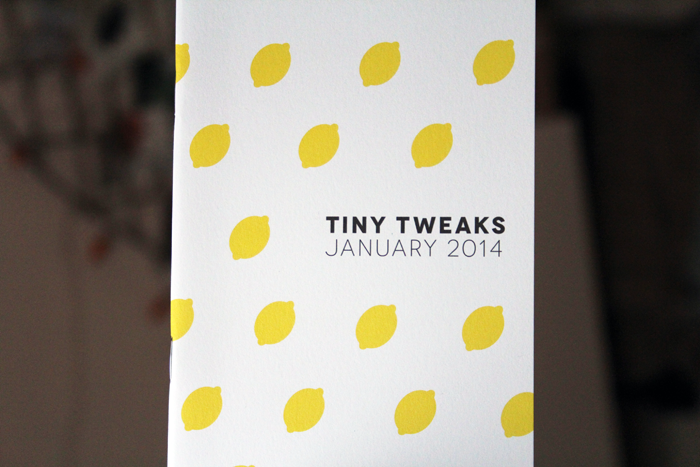 The theme this month is 'Tiny Tweaks' and the cute little booklet is filled with little changes you can make to see big results. 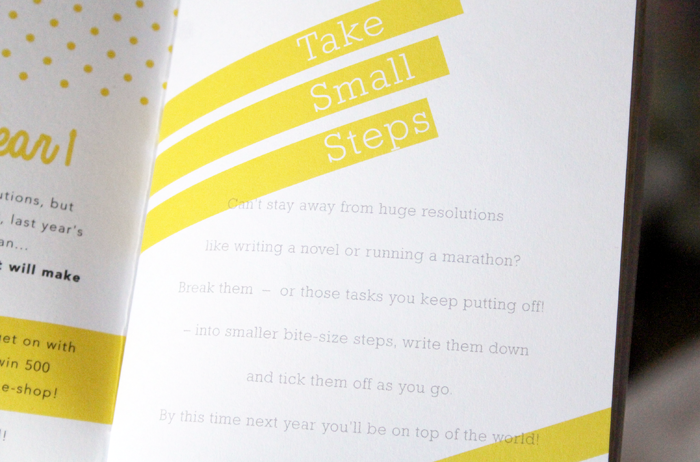 I really like the theme, it's certainly added a bit of extra positivity to my January and the bright yellow colour they've used is wonderful. They also seem to be pretty interactive with their subscribers, which I really like! My first impressions were that the box seems a little empty. The products themselves look really good but there was no shredded paper inside which is okay because lets face it, it just ends up straight in the recycling but I don't know, I'm a little surprised nothing exploded or leaked after being shaken around in there. 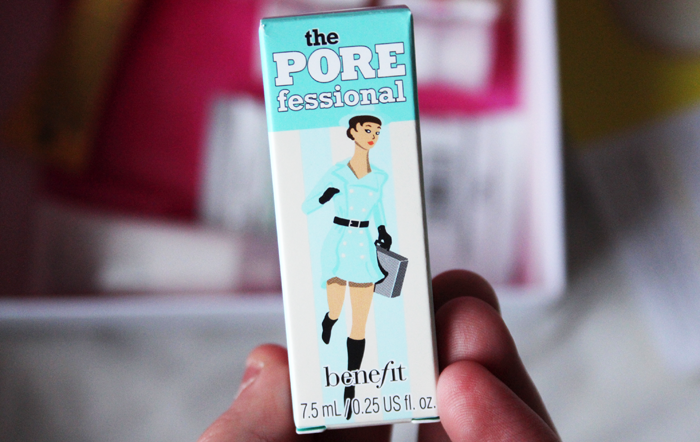 This is one of the most recognisable brands inside and although the POREfessional Primer isn't a product I would go out of my way to try I'm quite looking forward to seeing if it makes a difference. Primers aren't something that are a must have in my everyday routine, unless they promise to boost radiance. This is an award wining primer that promises to magically erase pores and leave skin feeling velvety smooth. It definitely left a velvet like feeling on my skin when I tried a little on the back of my hand, but I'm not sure if it's too velvety and might make my make up slide a little. We shall see! Premae is a brand I've not heard of before but I'm always happy to try out something I never otherwise would have come across. That's one of the things I like most about beauty boxes. Body oils can either be hit or miss depending on how quickly it sinks in to the skin, but I do love how hydrating they are so I'm really intrigued by their Instant Renewal Body Oil. It promises to moisturise, tone and detoxify skin with its natural formula. Sounds lovely and I do like that it's in a spray bottle! 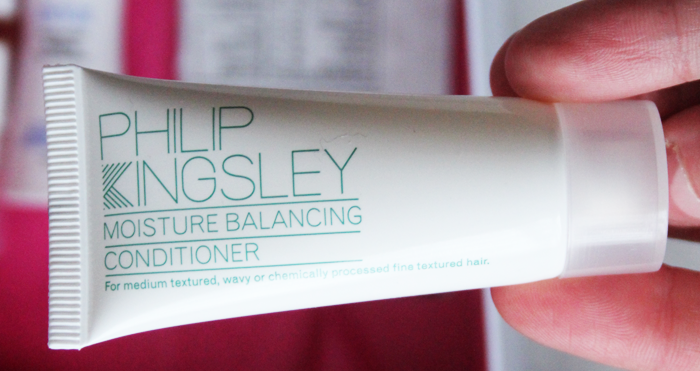 The only thing I've ever tried by Philip Kingsley is the famous elasticiser and I wasn't too impressed with it so I haven't tried anything else. Again this isn't something I would buy for myself, but I'm definitely interested in trying the Moisture Balancing Conditioner out to see how it compares to my usual more affordable conditioners. 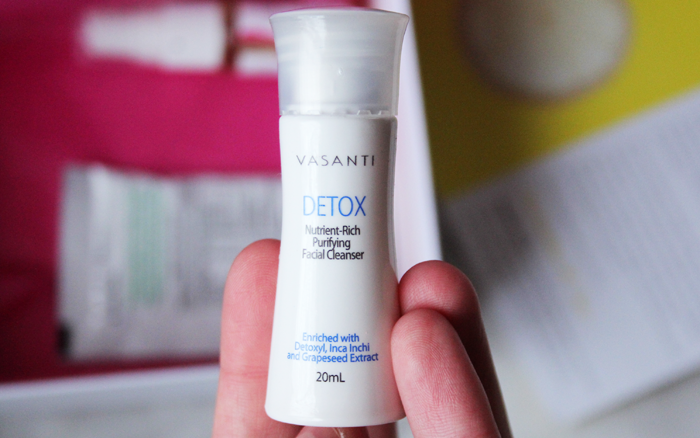 Vasanti is another brand I've not heard of before but I do like trying new cleansers so this Nutrient-Rich Purifying Cleanser will be something I'll be trying out tonight. This says it will wash away toxins and every last trace of make up, which sounds perfect to me. My one question with this Bee Venom Moisturiser is, how do they get the bee venom? I'm not really sure that I like the idea of this at all. The bee venom apparently helps to stimulate the production of collagen and elastin. It sounds like an interesting product, I'm just not sure it's one for me. Also the full size is a whopping £150! Overall I think this is a really wonderful box. I like the variety of the products inside and there's a mixture of brands I'm familiar with and ones that I'll be trying for the very first time. ooo i love everything in this birchbox! i've never bought into any of these subscription boxes but if i had to choose one i think it would be them :) i've been really into body oils lately and that premae anatomy one is a new one that i've never heard of, sounds promising though!! Oeh I love this box. You make it really tempting for me to get one of these boxes haha, all those updates and fun product. 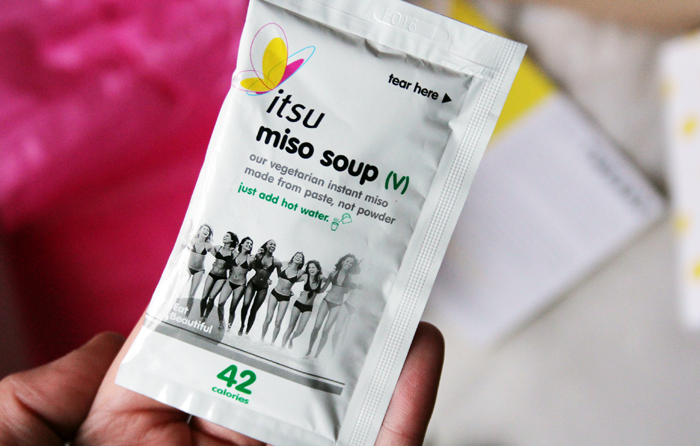 The Itsu soup and ladies on the package is a bit of a weird one... It almost looks like it's some sort of beauty product haha. Ha, ha! The miso soup packaging really made me laugh. At first the bee venom moisturizer sounded like something not too pleasant for the bees so it sparked my curiosity and I found out bees aren't hurt during the venom collecting. Wow, that's a great selection of products - what an impressive box! Looks amazing and sounds like some pretty good porducts this month. I hope mine is this good! This is a pretty good box too - you've done well this month, Jennie! I'm not a fan of the Porefessional, I did find it made my make-up slide although I have quite oily skin. Looking forward to hearing how you get on!! The miso soup packet is a bit odd.. Unless it's made with beautiful ladies..!? 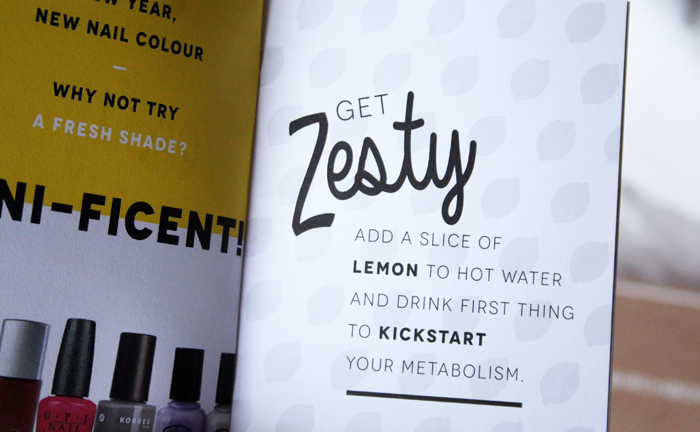 I love the lemon brochure. I've tried Birchbox before and have had too many shipping headaches…I don't really want to go back. The bee venom moisturizer sounds pretty... sketchy to me, haha. Seems like a lot of products nowadays are coming up with promoting strange ingredients. I love miso soup! I bought a small tub of miso paste the other day, yum! Out of all these beauty boxes on the market I must admit Birchbox seems one of the better ones :) what a great opportunity. That sounds great, how exciting. I have the Benefit sample and I can't work out if it's done anything yet haha. 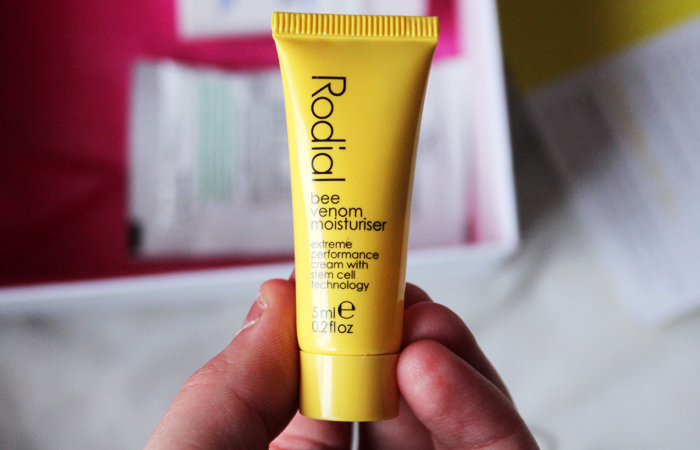 I also have one of the full size crazy Rodial Bee Venom serums which I hardly use, it smells nice and feels nice but again, I'm not sure if it does anything ha. This looks so good :) BirchBox always seems to have a good variety of products and brands! I have to say I am also intrigued by the Bee Venom :/ what people do for beauty!